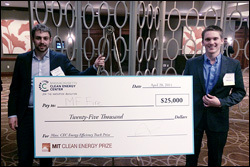 Taylor Myers (left) and Ryan Fisher (right) of MF Fire celebrate winning the $25,000 Energy Efficiency Track Prize at the MIT Clean Energy Prize competition. MF Fire, a startup company with roots in the University of Maryland’s Department of Fire Protection Engineering, won the $25,000 Energy Efficiency Track Prize and a People’s Choice Award in the Grand Final round of the MIT Clean Energy Prize competition, held in Boston on April 28. The young company presented Mulciber, an innovative, 93% efficient, wood-burning stove with “almost unmeasurable” emissions. Co-founded by Department of Mechanical Engineering graduate student Taylor Myers (B.S. '12, fire protection engineering) and Ryan Fisher (B.S. '12 and M.S. '13, fire protection engineering), MF Fire is hoping to commercialize stoves based on the one designed by Clark School students for the 2013 Wood Stove Decathlon. After their team won the decathlon’s Lowest Emissions Award, Myers and Fisher founded MF Fire, went on to compete in the 2014 ACC Clean Energy Challenge, and received a TEDCO Maryland Innovation Initiative (MII) grant to develop the stove’s next prototype. The Mulciber Stove, targeted at low-to-mid income households without access to natural gas, includes a forced air system, pressurized combustion chamber, and self-cleaning filter. Its chimney-within-a-chimney warms incoming air and cools exhaust, which improves efficiency and reduces emissions and heat waste. Some of the heat it generates is converted into the electrical energy that powers its fans. MF Fire will continue to promote the Mulciber Stove at business plan competitions. In April, the company won the Maryland semifinal round of the national RECESS Business Pitch, and is preparing for the finals in late May.